Burgh of Monifieth, Angus Scotland. Over the centuries the name of this ancient settlement has changed many times, as has the various conclusions as to the possible reasons for the title. My own personal preference being two other Gaelic words Manach Feith ( Monk`s bog or moor). Undoubtedly over the passage of time Monifieth has indeed been regarded as a historical holy place. St. Rules Parish Church has been a place of worship for Christians for well over 1400 years. The present Church standing on a site previously occupied by a Celtic or even Pictish religious community. St. Rule the Patron Saint of the Burgh reputedly a follower of St. Columba, allegedly brought the relics of the martyred St Andrew to Scotland from Patras in Greece. How long this hazardous journey lasted is unknown, some learned men have estimated several years. The journey ended in ship wreck off the mouth of the river Tay, near Kilrymont, later becoming the place known throughout the modern World as the town of St. Andrews. The journey of St. Rule did not end there in Fife, as he set out once again with the precious relics and his followers in search of the local rulers, Hungas, King of the Picts. After crossing the river Tay at a ford near Forteviot , in Perthshire, he met the King`s three sons, who were able to advise him that their father was on a mission of War against Athelstane, King of the Saxons. Their mother, Queen Fichem, wife of King Hungas was living at what was thought to be the home of her family Moneclatu, later to be known as Monichi, (translated as Monk`s house). Nearby this place was to be found a fortified stronghold of the Picts on Laws Hill. The treasured bones of St Andrew rested overnight at the home of Queen Fichem and later a Chapel was built in recognition of the historic place. This was named Eglismonichty. 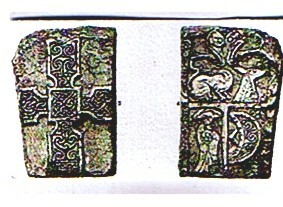 According to notable historians the story of St. Rule is mythical, but both King Hungas and Queen Fichem were rulers of the Picts in the eighth century. The bringing of the relics to Scotland has been attributed to the efforts of Bishop Acca of Hexam circa the year 732 A.D.. This would indicate that the story related rather to the Bishop, than Rule, who came to Scotland with Columba in the fourth century to form the Columban or Celtic Church. Communities of these monks of the Celtic Church formed into communities of beehive type cells, known later as Culdees. The name supposedly derived from the Irish, Ceile De, or Companion of God. The Church of St. Rule in Monifieth is built on what one time in the past had been a centre of the worship for the Companions of God and the Celtic Church of Columba. Several Pictish , and Celtic stones have been uncovered within the area of the Church and are now to be seen in the Museum of Scottish Antiquities in Edinburgh. Further evidence of the ancient past may be witnessed in the viewing today of the Souterrains or Earth houses all within the Monifieth district. The Culdees belonged to the Church of Monifieth until circa 1202 when a charter signed by Malcolm, Earl of Angus, (derivation of Hungas), granting to Nicholas, son of Bryce, priest of Kirriemuir, the heritage of the whole land of the Abthein or Abbey of Monifieth. Around 1310, Michael of Monifuth, Lord Abathania, most probably a descendant of Nicholas agreed to pay the Abbot of Arbroath, dues on the croft and feu farm he held in Abthania. Grange, an estate within the Parish boundaries of Monifieth was at one time the `home` farm of Arbroath Abbey. As the Grangaria or place where the tiend sheaves or tithes, dues to the Church were delivered and stored.. Early in the fourteenth century the Grange became separated from Arbroath Abbey and was granted to Sir William Durham, by King Robert the Bruce for services rendered as a Knight. For nearly four hundred years the Grange remained in the possession of the Durham family. Lady Jean Durham of Grange was a central figure in a historic incident connected with the Parish , when she organised and almost succeeded, in the escape of the famous Marquis of Montrose, who was lodged overnight at Grange house on his journey to Edinburgh and eventual execution. Around the central Church many notable families built their residences or castles. The Maule family, Earls of Panmure, had a castle at Ardestie, in Monifieth. The main residence the Castle of Panmure was in a ruinous condition and in 1648 the then Earl bought land to build a replacement. National troubles delayed the building project until 1666 when Panmure House was eventually erected. Work was not finally completed until sometime, near the death of George the second Earl, who died in 1686. These delays resulted in Ardestie Castle becoming the main family residence of the Maules for over forty years. James Earl of Panmure, was born at Ardestie Castle. James was a staunch jacobite and for his devotion to the `cause` at the Battle of Sherrifmuir, lost his titles and estates. Over the years pendicles or crofts gradually appeared around the area of the Parish Church. This became known as Kirkton of Monifieth. In the early eighteenth century the main industries included quarrying, weaving within the home and the start of the manufacturing of linseed oil at a water powered mill, by the Dighty burn, later to be name Milton of Monifieth. Although Monifieth had no harbour a considerable amount of cargo from coastal vessels was off loaded on to the sands at low tide and moved by horse drawn vehicles to nearby destinations. Salmon fishing was a very profitable trade at Milton of Monifieth. In 1825 the rent of the fishings was £15000 and as many as 729 fish were recorded as having been taken during a tide. Another popular pastime was smuggling. 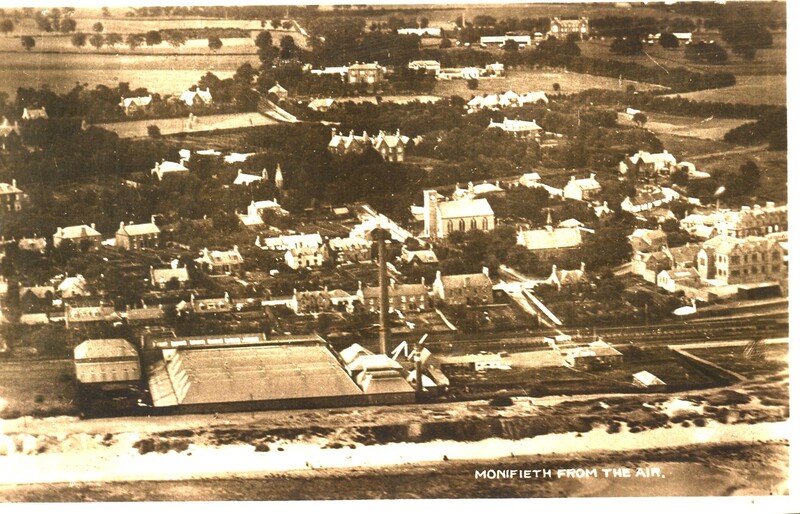 The nineteenth century and the industrial revolution changed Monifieth with the establishment of spinning works, two foundries producing machinery for export to India and other parts of the World. The industries resulted in the building of a rail link between Dundee and Arbroath, also a link with the Dundee Forfar direct line. With the need for skilled workers the population of Monifieth increased dramatically. With the expansion of the jute industry and engineering works Monifieth also because of it`s reputed clean fresh air, driest climate in Scotland and wonderful scenery, became the place where the so called `jute barons and captains of industry`, built many superb mansion houses for their main family residences. 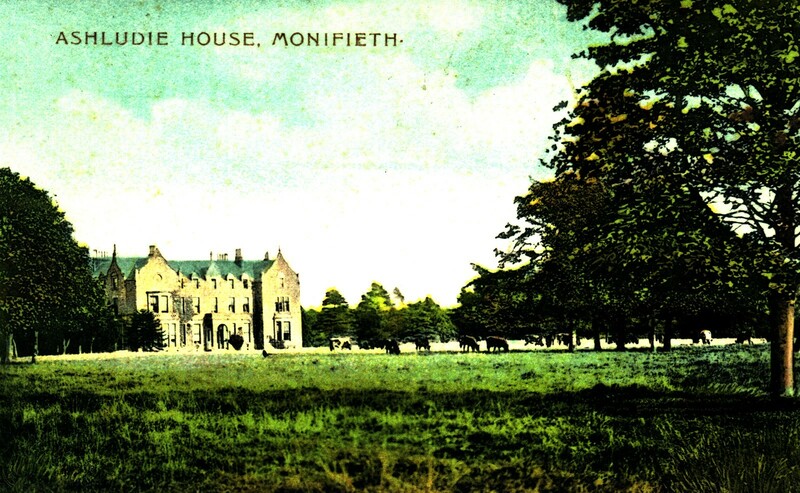 In 1895 Monifieth was registered at Forfar Sheriff Court as a Burgh. No longer did it hold village status. With the formation of a Council and Officials, it progressed into the next century as a very desirable place to live. A tramway service was introduced in 1905, with cars journeying into DundeeCity centre at regular intervals. This service was welcomed by the vast number of people, who commuted daily, to work in the Monifieth factories and foundries, or those travelling into the City daily on business. The apparent affluence of the Burgh prompted several attempts by the City Council of Dundee to annex Monifieth to within it`s City boundaries. In 1913 a petition signed by the residents was presented before Parliament in London and successfully influenced the retaining of Monifieth`s independence. However, government legislation in 1976 dictated that Dundee became responsible for the Burgh of Monifieth, with the abandoning of all Monifieth Municipal Services. On 1st April 1996 due to further government intervention Monifieth residents found themselves under the jurisdiction of Angus Council. Monifieth has had a very interesting past history and in several hundred years what the historians will highlight as the “best times for Monifieth”, one would hope to be the start of the twenty-first century. Unlike some of the adjoining coastal areas, Monifieth does not have rocky coves or inlets with caves to hide contraband from Her Majesties Customs Officials. However, in the past this did not deter the local people from part taking in what must have been a very profitable past time, and keeping high the spirits of the local population. Records have shown that Milton of Monifieth was a favourite haunt of the `gaugers` who would lie in hiding waiting for a foreign vessel to come ashore on Monifieth sands. Many locals, who were lovers of boating and fishing enjoyed the daytime pursuits of these pleasant pastimes. Codling and other fish, in an ordinary season were to be caught in abundance. The activities of the pleasure boats during darkness might have been more lucrative. Prior to the building of the railway through Monifieth the sands of the bay were the landing area for the arrival of coal, lime and other necessities. Horse drawn carts from throughout the district were always in readiness to move goods away from the in coming tides. John had retrieved the barrel and secured it with ropes to his back, when two representatives of the law appeared before him. John an `honest` Christian could not tell a lie and was charged and taken into custody by the law enforcement officers. With his hands tied in front of him by ropes which were attached to the officers arms and the barrel still securely fastened to John`s back, the three set off on the ten miles journey to the County town of Forfar, to find a magistrate. Even in those bye gone days news in Monifieth travelled fast and soon John`s friends were alerted of his predicament. The trio had not journeyed far when a silent figure moved up behind them and cut the barrel free. Without a word John marched on beside his custodians. Eventually they reached Forfar and the magistrate who apparently knew John but not the gaugers. The case was stated before the magistrate and requests made for commitment. The fate of the missing barrel remains a closely guarded secret. More is known of the fate of the `New Delight`, a sloop of circa 1820. A Government cutter had sighted her off St Abb`s head and gave chase. Trying to out run the cutter, New Delight had every sheet of her canvas in use. When she reached the Bell Rock it was obvious, she was being overtaken, by the Government cutter. With no chance of escaping, the ship sailed into the Firth of Tay , discharging her cargo of barrels into the water to lighten the vessel and gain some speed. Eventually she was stopped opposite Buddonness, when hopefully all evidence of guilt had been `given up` to the sea. The boarding officials searched the vessel and could find no contraband. They were about to leave the ship, when someone observed that she had a very thick deck!. Closer examination showed that this was a false deck hiding in the hollow below a vast quantity of the best smoking tobacco. The forfeited sloop, was sold to a Carnoustie coal merchant by the Government and the `smugglers` required to pay a hefty fine. Where are the barrels? All washed up? 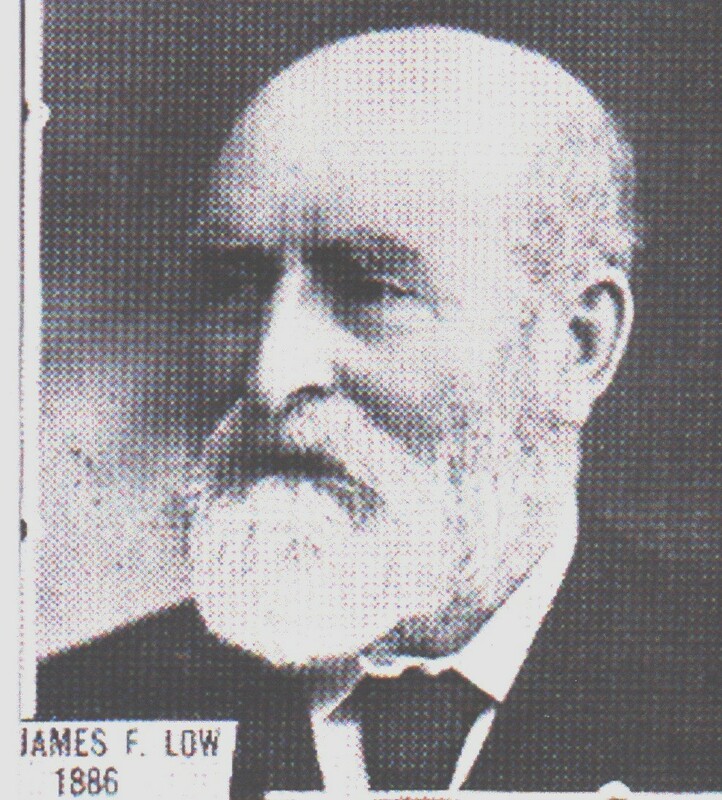 William Low, a name that is recognised by most people with Monifieth connections. He was the man responsible for the success of the former engineering works which covered approximately an acre of ground in the centre of the Burgh , adjacent to the Railway Station. Mr Low and members of his family were also the financiers behind the building of Seaview House, Ashlea, Tighnamuirin, Springbank and other properties. It came as a surprise to find his name mentioned when reading and researching activities associated with smuggling. Mr Low, for many years boarded and lodged the apprentice boys from his factory at his home. A large wing extended from the back of his house comprised of a dormitory and dining room. As many as one hundred and twenty boys were recorded as living in the accommodation. Mainly sons of mill managers they were serving their time in Monifieth, in order that they might be ready to fill responsible positions throughout the industrial world. In 1850 this practice was stopped due to management difficulties. Stories of the apprentice lads` activities have survived. One of particular interest concerns the housekeeper or matron who was in charge of meals and accommodation. Jean treated the boys, who in her opinion could do no wrong, as her own. Porridge was served with beer if milk was in short supply. One day when preparing the meals Jean searched the cellar for drinks for her lads. She uncovered some dusty bottles that had been hidden away. Breakfast past as normal, and when a bell announced the time to start work none of the apprentices appeared. Jean went to the dormitory to find them “ all asleep or clean daft”. Mr Low was not amused when called to the emergency situation. Jean was responsible for his hoard of fine Madeira that he had risked so much to land from a lugger , being all gone and giving her boys too much of a good thing. In 1788 Customs officers were `making a seizure of spirits about a mile and a half north east of Dundee, when they met with obstinate resistance`. The onset of the violence was instantaneous, when the smugglers were asked to stop the cart carrying the goods. The `gaugers` were carrying arms and in the melee Andrew Duncan, the driver of the cart was fatally wounded. Two of the three others accompanying Duncan were named Baird and Steen, well known smugglers and residents of Monifieth. Steen was wounded in the skirmish and suffered cuts from a `gauger`s` sword. Bales of tobacco, wines and spirits, playing cards and candles were among the items impounded by the customs officers. In 1820 the excisemen unexpectedly appeared at the alehouse at West March . The serving maid, Barbara Souter, aware of a quantity of illicit spirits having been delivered, was equal to the occasion. To the place where the contraband was stored she took her bedding and when confronted in her bed by the exciseman she became critical and abusive at his entrance into her private quarters. The landlady was asked as to why she kept such an aggressive servant. Her reply she, “meant to have the valuable lass wed to one of her sons as soon as it was possible.” This in fact was a promise kept. In Monifieth there were, and perhaps there are still today descendants of the marriage of the two. The other alehouse in the village, to be found beside St Rules Church, Jennie Barrie`s Inn. A small thatched house, the road to which – for the house still stands – runs west from the ParishChurch front door. “It was a convenient place for a quiet dram. Many happy nights were spent beneath her spreading rooftree.” There the parochial forefathers, of the village met and cracked their jokes, and discussed country affairs in general, the gossip of the district in particular. The Bull sales were recorded as taking place in Jennie`s hostelry. It has been said that jollifications could take place within Jennie`s `public` from the time that a sloop left the bay for Newcastle then returned with another cargo for unloading. If a man had sufficient money to set up a brewhouse, this was quite acceptable on the proviso he paid Government taxes and dues, and carried on decent and respectable trade. 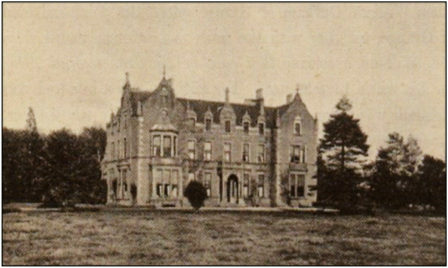 The `old brewhouse` was located on the site of where now stands the Gerard Hall and the corner of the garden of the Victorian Villa known as Ashbank. The good strong ale produced when barley bree was converted, added life and vigour to those who partook of it`s refreshing draft. There was no scramble in days gone by for licensed houses to sell the brew, locally named “kill the carter”. Until the Government Act introduced by Forbes McKenzie there was no time restrictions on time or place as to where those wishing to do so, could imbibe in strong drink. In fact a smugglers paradise. The start of World War 11 triggered off a series of events, which are still remembered and talked about, by natives of Monifieth and the surrounding district. In the last few days of 1939 an Aberdeen trawler was wrecked on the `blacked out` Bell Rock. The start of 1940 brought another shipping disaster. On 6th January a passenger-cargo liner of 8300 tons City of Marseilles, bound for Dundee with a load of jute, touched a magnetic mine, near the Gaa Sands at the mouth of the Tay. The mines had been parachuted from German aircraft into the shallow water, where they lay on the bottom, in the approach to ports. Two types the mines were found to be either magnetic or acoustic. Overhead passage or contact from a steel hulled ship resulted in detonating the magnetic mine. The noise of the engines caused the setting off the other type. Some of the explosions were of great violence. Many of the ships, notably the larger ones did not sink at once, and some not at all if it was a `near miss`. The `City of Marseilles` was a case in point, the engines were put out of action. The hull remained intact. A crew of 163, made up of 26 Europeans and 137 Asians quickly launched the lifeboats. Two lifeboats were destroyed in the explosion, and unsure as to whether or not the devastation had been caused by a mine or torpedo hit, their hasty embarkation was executed in order to avoid any U boat intervention. Perhaps the rush was what caused two of the lifeboats to capsize and many of the Asian crew being catapulted into the freezing water. One Asian sailor lost his life. The Pilot cutter, with river pilot A.J. Cook on board, was nearby when the disaster occurred and picked up survivors from the water. The four remaining lifeboats were taken in tow by the cutter, and at Broughty Ferry the survivors greeted by a large crowd, who were waiting with supplies of warm clothing. The Pilot A.J. Cook, with several of the European crew remained on board the `City of Marseilles` until it was possible to get a line aboard for tugs to pull the ship into DundeeHarbour. On the 27th January 1940, a smaller vessel of 3000 tons, flying the flag of Estonia, named `Anu`, bound for Dundee with a cargo from Sweden, which comprised of Butter, Ham etc. When approaching Gaa Sands, she hit a mine, which completely shattered the engine room, and blew the ship apart. The `Anu` sank within minutes. Of the nineteen members of serving crew six died, this included the captain and his wife. Those who survived, ten men and three women, many suffering from severe burns and scalding took to the life rafts. Eventually after a night afloat they landed on a `sandy `beach and could see signs of habitation, at what they were later to discover was Carnoustie. The cook was so badly injured she was left in the dunes, while the others went in search of help. As dawn broke they reached some cottages on the links. A five hours search was mounted, before the successful conclusion of `finding the cook`. Later in Dundee Sheriff Court two of the survivors, a stewardess and a crew member , were married. Others remember the incident for other reasons. Cans of tinned ham, eggs and barrels of butter were washed up on the beach of Buddon Ness and on the `Fife` side of the Tay estuary, from the cargo of the stricken `Anu`. Scores of people made their way through the snow covered links in the hope of retrieving some of the items, no longer available by the general public, by the restraints of war time `food rationing`. Aware of the warnings by Police and Customs Officers, the Tayside Beachcombers ignored threats of prosecutions to those who retained butter or ham `picked up` on the beach. Locals recall their personal experiences and eye witness accounts. “I took my sledge down to the beach. It was a bitterly cold morning. I left home clad in an old pair of my father`s `plus fours`. The beach was deserted, but I spotted two wooden crates lying on a sandbank, to the west of the Dighty burn`s outlet. I pulled the trousers up as far as I could and waded on to the sandbank. Even on a warm day I doubt if I could have undone the metal straps which held the crates together. Three men came from a car — I was to learn later, that they were Arbroath fishermen— walked out wearing waders and lifted the two crates. The tins were large and oval, if my memory serves me correctly, and contained cooked ham. I proudly presented the tin to my mother. In the early days of the War and rationing it was probably as precious as a `pot of gold`. The contraband was shared out between neighbours and friends, though we had `the lions share`. From the same vessel, mined at the mouth of the Tay, I retrieved a barrel of fresh butter, also washed up on the sandbank, and several large lumps, at different times. The first half to two inches was cut away. What remained was found to be perfect. These were the days when only the large mansions had fridges, so the butter was kept in containers of cold water, and home baking daily made it even better than the wartime Christmases. The flotsam was a `God`s send` and neighbours shared in the spoils. The Police put out warnings that all flotsam and jetsom found on the shore had to be handed to them. I believe that some butter even found the road to bakeries in Broughty Ferry”. Another recalls the `Great Clean Up`. One beachcomber, a female, related how, “Having heard of the butter and tins being washed up along the shore, we quickly made our way there to try our luck at recovering some. We were fortunate enough to find some butter, there was quite an amount of sand attached to it. Taking it home the sand was cut away and my mother made some very tasty shortbread. Concerning a recovered tin of ham, however, we carefully selected a grassy part of the shore, with rabbit burrows, and happily buried it. We intended to come back and retrieve it the next day. As you may have guessed, when we did so we had forgotten which burrow we had hidden it in. We never had our cold ham to supplement our rations. Who knows, that tin may still be there after sixty years? 1788 was the year when Sir George Ramsay, Bart. Of Bamff (Perthshire) accepted ownership of Ashludie. This branch of the Ramsay family held Ashludie until 1864, when it was bought by Alexander Gordon, a flax spinning manufacturer of Arbroath. Gordon was responsible for the building of the magnificent mansion house in 1866, and the laying out of the surrounding gardens. The interior of the house is decorated with beautiful plaster worked ceilings and friezes, enhancing the fireplaces made of white marble. Magnificent even in present day use, but when part of a family home, surrounded with domestic furnishings, absolutely spectacular. The gardens were upgraded to the same high standard, to be in keeping with the house. It was said that at one time a specimen of every tree natural to the United Kingdom could be found within the grounds, in the company of many imported species, such as Spanish chestnut, Walnut, Monkey Puzzles etc. It was credited as being one of the most compact and attractive estates in Scotland. Mr Gordon, for over twenty-five years took an active part in local affairs..
On 26th June 1911, at his Ashludie home, Mr Gordon died aged 88 years. Dundee Corporation on 3rd June 1913 acquired the Mansion house and 48 acres of land, for the sum of £7,500 . 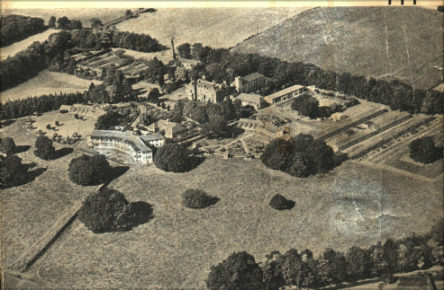 Accommodation to provide a sixty- bed sanatorium was added at a further cost of £8,500. The Hospital was opened on the 9th February, 1916, by Mrs William Don, of Ardrossan. The Surgical block was originally built in 1932 as a combined thoracic and orthopaedic unit for tuberculosis. Unfortunately the idea was not developed until 1947. In the early 1970`s, general, neurosurgery and specialised orthodontic surgical procedures were carried out in Ashludie Hospital. Emergency wards were built in 1940, by the military authorities, to accommodate air raid casualties and war wounded. Post war, they were utilised for the medical treatments of patients suffering from respiratory complaints. AshludieHospital medical staff considered to be `leaders in the field for the treatment of chest problems`. The `open` air regime being favoured, at the time, where patients were nursed in open sided chalets, which were turned to follow the sun, or wards with French windows opened to the elements. The well laid out gardens and grounds were very much appreciated by both the patients and staff. The opening of NinewellsHospital , Dundee, initiated the eventual change of the Hospital to Rehabilitation and Care of Elderly Patients. I cannot vouch for the truth of this story, but pass it on as I heard it. William Craig was the local schoolmaster. He was a most learned man who in his day wrote and had published a book on Arithmetic, Vulgar and Decimal fractions, also tables of Coins, Weights and measures used in various countries. He was fond of a dram, or a frolic, without being very scrupulous about the means or calculating the consequences. One evening returning home with a friend, after quite a `hectic` time, and knowing there was a `wake` in the village, the pair decided to play a prank. They agreed to attend and there they would entice the mourners from the room where the corpse was `laid out` for burial, with a bottle of whisky. Craig and his friend would agree to stand by the corpse while the other mourners, left the room going outside to enjoy a `small refreshment`. Having succeeded in the first part of the ploy, the pair would then remove the dead body through the open window, to be hidden in an outhouse, while Craig`s friend took the deceased`s place on the bed. It was agreed when the mourners returned to the room Craig would cough, and his friend shrouded like the corpse, would rise up from the bed and the pair of them would enjoy the alarm and terror of the others. When all the mourners returned and were seated, Craig gave the pre- planned cough, but nothing happened. He coughed again, louder this time, but again no result. Becoming alarmed Craig approached the bed thinking his friend had fallen asleep, but great was his consternation, to find his friend had died. Mr Craig`s emotions and feelings , as can be imagined, entirely overcame him and he had to confess to the mourners, what had happened; their agitation was extreme. The efforts to revive and restore life to Craig`s friend proved unsuccessful. When the confusion had subsided, Craig with one of the other mourning party, went to the out house to bring back the original corpse, but it was not to be found. The alarm and consternation of the company was now worse than ever. A search was mounted all around the village but without result. Craig was driven to distraction and wandered all over the district looking for the corpse. For three or four days he searched until eventually the body was discovered in a field, in the Parish of Tealing. Miss Dorothy Rattray, former primary school teacher and life long resident in Monifieth. When teaching in Monikie Primary school, Miss Rattray travelled daily from Monifieth. In order to get to the country school it was necessary for her to start the journey very early in the morning. First she would get the bus from Monifieth to Barnhill Railway Station, where she boarded the steam train for Monikie. This was part of the route of the Dundee to Forfar Direct Line. Following her arrival there, she had a considerable walk, by the side of the reservoir to the School . In winter, because of the short daylight hours, classes commenced at 9.30 a.m. In summer, the school was opened for a 9 a.m. start. There had been occasions during the winter months, when the weather was bad, with snow on the ground, Miss Rattray arrived at the school to find no pupils. Children from the surrounding local farms had been unable to get through the roads, which were blocked by drifting snow. As she was required to leave her home so early in the morning, it was impossible to contact her with this information. Transport was a problem for her earlier in life, during the General Strike, of 1926, Monifieth residents, with a need to travel out with walking distance of the Burgh, had to depend on the willingness of those with motorised transport, to volunteer to carry those less fortunate, to their destinations. Miss Rattray found it amusing to relate how that in order for her father to get to his business in Dundee, and her to travel as a pupil to her DundeeSchool , they were given a `lift` by a family friend Mr Morrison. Mr Morrison was the owner of a motor cycle and side -car. Mr Rattray and Dorothy were taken in style in the side-car, Mr Morrison`s daughter rode pillion behind him. Unfortunately Constance her sister, ( also a well known former MonifiethPrimary school teacher) with no means of transport, stood crying at their departure and her enforced absence from attending classes at school. Life for a child, when she was young was almost idyllic, with freedom to play in open fields and the ability to walk between her home and the various meeting places, unaccompanied by adults, yet in complete safety. Winter in Hill Street, with very little motorised traffic, provided the perfect location for sledging. When she was seven years old, the Rattray family moved into what is still her present home, Viewfirth, Hill Street. Prior to this, the family home had been located in Dalhousie Street. Recollections of Hill Street, as a child , was of green fields, with no houses on the opposite side from Viewfirth. “The cows from Laws farm, came right down to the fence across from the house”. Eventually other houses were built. On the instruction of a Mr Johnston, Orford Lodge was built and proved quite an attraction and novelty, due to the number of windows installed. During World War 11, similar to other Monifieth women, Miss Rattray was a volunteer to help the War effort. Under the leadership of Mrs Mathers, wife of the local baker, she assisted in a NAAFI type canteen established in the South Church hall, catering for locally billeted troops. The service was organised and run by The Countess of Strathmore. Opened from 6p.m. until 10 p.m., they served snacks, sandwiches, filled rolls and freshly cooked chips, tea, coffee and soft drinks. There were also some forms of entertainment such as dancing etc., as a few marriages with local girls resulted from `canteen` friendships. Mrs Rattray, her mother was given the honour of driving the last tram -car from Dundee to the Monifieth terminus, outside the Royal Hotel (circa 1932). Prior to the occasion her mother had undertaken driving instruction. Mrs Rattray was also a very successful lady golfer, having in her day been awarded trophies for her performance on the course. One particular prize being a set of engraved teaspoons, as winner of a competition on the Barnhill nine hole course. Although, not a golfer himself, her father , a very prominent local politician, was granted the honour of driving off the first ball, at the opening of the Ashludie Golf Course. Mr Rattray served on the Monifieth Council from 1911 / 1936, with one spell as Provost. He was a prime player in the bid to resist Dundee`s attempt in 1913 to absorb the Burgh into the Dundee City boundary. He travelled to London with the party who successfully put forward their objections to such a plan. The council members, who were elected then, were totally independent, with no affiliation to any political party. Their time and services were given freely for the benefit of Monifieth Community. The old Council Offices were located next to the Co-operative store ( Manager Mr Matthews), in part of what is today a second hand car showroom. Monifieth residents health problems were the remit of the local general practitioner Dr Richardson, who for some time held his surgeries in his house , off the High Street, behind Carr`s the grocers. Dr Richardson then moved to a house he had built in Albert Street, later the home and consulting rooms of Dr Taylor. One particular memory of treatment from Dr Richardson being that both she and her sister Constance , had their tonsils removed by him, while lying on the kitchen table, in Viewfirth. A consultation with the doctor at his surgery cost 6d. Home visit consultation cost 2/6. 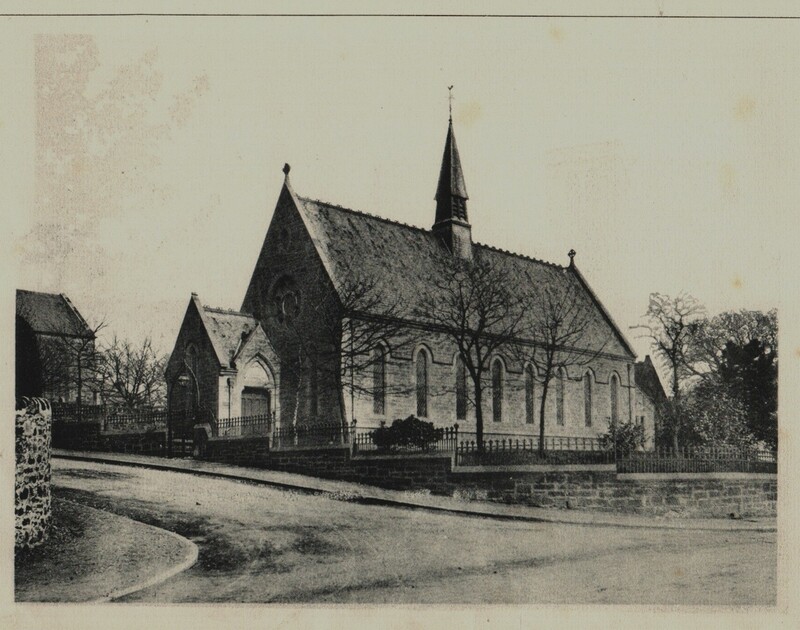 Miss Dorothy Rattray and her sister Constance are very well known to generations of Monifieth people for their dedication to Primary School children and their unstinting support and service to the Panmure Church. In 1913 there was an attempt by the City of Dundee Council to `take over` Monifieth and bring it under their jurisdiction. This idea was totally unacceptable. 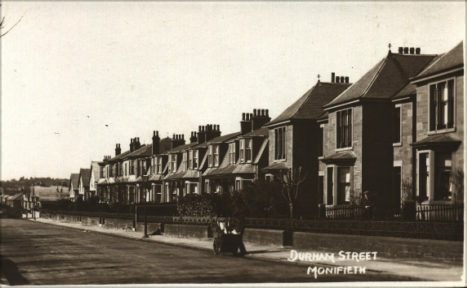 The residents of Monifieth protested and signed a petition, which was presented to the Prime Minister, at 10 Downing Street, by the then Provost. Mr Burns Petrie, who was a solicitor, was part of the accompanying party. Negotiations were concluded with a successful outcome and Monifieth remained an independent burgh. When the victorious negotiators arrived back at Monifieth Railway Station, they were met by many local supporters, who carried the Provost shoulder high to his home. The Burns Petrie home in 52 Durham Street, Monifieth, was built for her father by Carnegie House Builders, Barry village, at a cost of £1,000, in 1903. When the house was completed, it was totally surrounded by green fields. 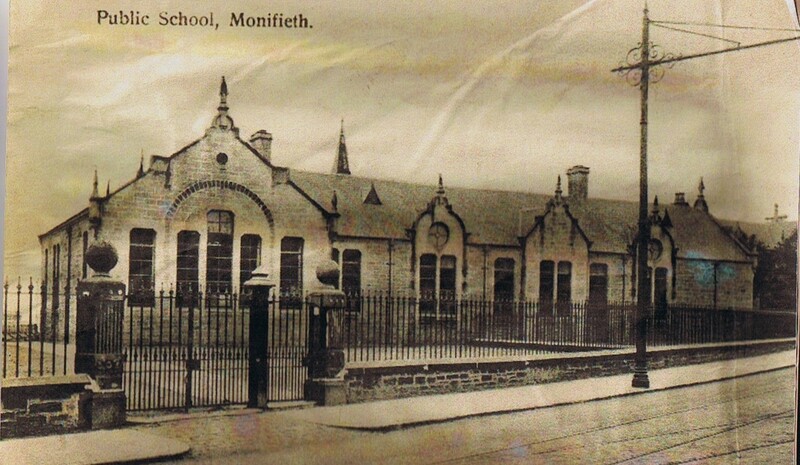 Although Monifieth Public School was attended by most of the local children, Miss Burns Petrie`s primary education was at the private teaching establishment run by a Miss Mann. This was located in rooms of what is now the South Church Halls in the High Street. On the outbreak of World War 11 in 1940, similar to other Monifieth families, the Burns Petrie household was required to `board` evacuee families, mainly from Dundee. For the Burns Petrie`s `guests` this was a short lived venture, as after a few days, the mother of the group decided to return home, because “Monifieth was ower quiet”, and she did not approve of being asked to have baths! Polish Army Officers were then billeted in their home. Miss Burns Petrie recalled one particular officer who they called Archie, as his name was difficult to pronounce. He had told them of how prior to the War, he was separated from his family and had no knowledge of their whereabouts or survival. One day a young man appeared on the Durham Street doorstep, looking very pale, tire and ill. He had great difficulty in making it understood “he was looking for his father”. This was Archie`s son, who was a sailor. Reunited for a time together, father and son both lived within the Burns Petrie family home. Monifieth was not safe from German air raids. A bomb fell on Milton Mill, at the time being used to billet soldiers. Two or three men were killed in the direct hit. Another incendiary device landed in the then front garden of the Burns Petrie home adjacent to Ferry Road. No injuries or damage was caused on this occasion, but a large burned out crater marked the point of impact. Many women worked in the production of material for the War effort. James F Low`s Manufacturers, worked day and night shifts. Some skilled girls were involved in the building of tail formations of aircraft. Travel was mostly done by rail and the steam train, or by tram- car. The morning trains were crowded with people going into Dundee on business. At the same time they were transporting workers to the foundries of J.F Low or Low and Duff at Albert Works. The “chained monkey on all fours” keeps it`s secret safe. The RemembranceGarden was appropriated for the building of St Rules new Manse and when work began on digging the foundations, the remains of a woman and child were discovered buried outside the kirkyard wall. It was the custom in and around the early 1900`s for the people of Monifieth to go to the home farm at Ashludie for their milk supply. The home farm belonged to Mr Gordon of Ashludie House— now the hospital—and I was engaged to carry the milk, eggs and fowls from the farm to the `big` house. One morning on the way to the farm a voice, from a man leaning over his garden gate, hailed me. “OK”, I said but did not give the matter much thought. Arriving at the farm I duly picked up the milk and basket of eggs and proceeded to the `big house`. I had not gone far when in the lade, at the back of the farm, I spotted a body lying face down in the water. Laying down the milk cans and eggs I rushed back to tell the grieve and his wife. We all ran up the road and pulled the body out, but life was extinct. The grieve`s wife said she would deliver the milk and eggs if I went back to tell the man what had happened. “I am sorry to say your wife is dead”, I told him “ we pulled her body out of the lade”. “Dear, dear,” he replied. “That`s awfa`, and me just bought a bottle o` medicine for her yesterday and it cost a shilling. I wonder if the chemist will tak` it back? Not long after the above incident there was another episode. I was on the way to the farm for our milk supply. It was between 5.30 and 6 o`clock in the morning, when it was becoming day light. In the distance I saw a man with a barrow approaching. Coming nearer I was astonished to see a pair of legs dangling over the front of the barrow. “Weel,” replied James, “Since ye`ve speired. It`s the wife. She deed in the Gerard this morning and always wanted tae dee in her ain bed, so I`m takin` her hame tae pit in her ain bed”. When I got home I told my parents what I had experienced. They thought I was romancing. However, my mother and aunt went down to see, and sure enough James`s wife had died and been wheeled home as I had related. James Gerard Young was called to the Parish of Monifieth in 1855 and thus began a most remarkable ministry, which lasted for 44 years. Three of the largest buildings in Monifieth were erected, directly or indirectly through the efforts of James G. Young. The school in Maule Street was erected when Young was Chairman of Monifieth School Board, and in consequence he had to stand much abuse from the rate-payers for spending their money. During his lifetime the school proved too small for the needs of the Burgh and had to be added to. He took great delight in pointing out from the pulpit that his foresight had been greater than the rest of his parishioners. In 1879, St Andrew`s University conferred on Young the honorary degree of Doctor of Divinity, and Parishioners took the opportunity to make a presentation to Dr Young. 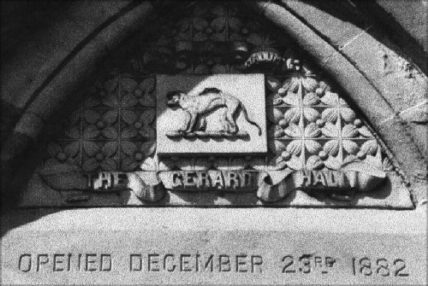 The money was used by him to form the nucleus of a fund that saw the erection of the Gerard Hall in 1882, at the total cost of £2000. Who or What were the `Hellites? In my search for information about Monifieth`s past history I discovered some puzzling details printed in the now defunct Lochee Herald of July 1902. Apparently Monifieth had suffered due to a high rise in unemployment figures, caused by the stoppage of the local jute mills. Many Monifiethians were thus compelled to leave the Burgh. (or as uncharitable people might say “for Monifieth`s good ) are coming to roost. There has been an increase during the past year of fifty -one appeals to the Parish Council, thirty three of which were from Monifieth mill workers. The writer who used the by name Owl, hoped “Monifieth would not feel sore about this, and in the interests of Monifieth the former `Little Hellites` would manage to paddle along without having recourse to the Parish Council… Where was this place and it`s much deridden residents? The article also made mention of “In October 1901 it was decided to clear out `riff-raff` and by the operations of Low & Duff, limited, Little Hell has become something in the nature of a cottage garden”. Was the area referred to as `Little Hell` the mill workers cottages built on the Links, also known to many locals as the `Bricklands`, which made way for the upgraded housing known as Albert & Windsor Terraces? From the Peoples Journal of 24th January 1903, I believe I found the answer to my puzzle. It describes how the foundry stands on a strip of ground, which separates the railway from the river. Office Block & Cooling Ponds of Low & Duff`s Foundry, Albert Works. Albert & Windsor Terraces, & Bricklands. From the back of Galloway Place to the High Street, was the `Parkie`. There was no Wellbank place then. It was just an open space where th youngsters enjoyed playing. In the south, west corner we had a den built of corrugated iron, with a roof covered by divots. This was where `the gang` plotted some weird on goings, but not of vandalism as practised today, if you can accept apple plundering as just a youthful frolic.It was an unwritten law, however, that the gardens of parents were never touched. The `parkie` was the place occupied by the circus, when it called every year. Pinder Ord`s circus was the big event. They had elephants, tigers, horses, clowns and tight rope- walkers. They offered one pound to anyone who would go into the lion`s cage , with the trainer. That amount of money spelled a fortune to `the gang`. We drew lots from0 to 5 and whoever drew 0 would go in. There was no backing out, and Pete having drawn 0 duly fulfilled the `beaster`. He followed the trainer into the cage. The lions growled, roared and pawed at the trainer`s whip, but Pete stood his ground; emerged in triumph to the cheering of the crowd and received the well -earned pound. The next night five pounds was offered to anyone who would go in the cage solo, but there were no takers. `The gang` had a gorgeous time with the proceeds of the venture. Morrison`s Show spent the winter months every year at the High Street, where the filling station is now located. They had a stand for coconut shies, hoopla, Aunt Sally and shooting gallery. The shooting was done down a tube, if you rang the bell you were awarded a florin. We had a crack Miniature Rifle Club in Monifieth, at that time and so many were ringing the bell that the shooting was abandoned. On Saturday nights the Morrisons put on a show. There was an acrobat, tight- rope walker and a strong man. Everyone went to the show. The ploughmen and their wives from the surrounding farms attended and there was great laughter when some of the competitions such as eating treacle scones took place. 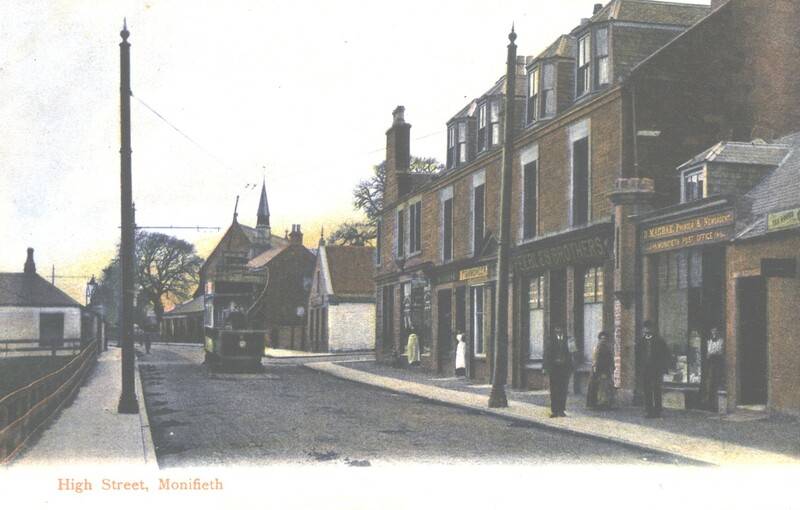 In 1894 the increasing numbers of residents in Monifieth were resolved to make it a Burgh. The Parish Councils Bill, then before parliament hastened the matter. The Sheriff of Forfar, John Comrie Thomson, visited the district, heard all the objections and after some alterations were made to the suggested boundaries, which were agreed, declare Monifieth, population being 2020, within the meaning of the Act. The boundaries defined as extending from on the west low-water mark, along the Broughty Fery boundary at Marshall Place to a point 465 feet north of the public road leading from Broughty Ferry to Monifieth. Northern boundary stretching north-eastwards, including Grange Cottage, the Fonstane Wood and from that point marked by a ditch until it reaches the road to the north of the Uplands. The south side of the wall forming the boundary of Ashludie policies, thereafter continues until the west side of the private footpath leading from Ashludie policies to the public road at Monifieth. This footpath then forms the eastern boundary to a point 400 feet south of the road leading from Monifieth past Ashludie farm, which a straight line southward to low-water mark completes this boundary. 10th January 1895 at 8pm in the Gerard hall, Monifieth . At a public meeting of the householders, and under the presiding Sheriff substitute Campbell Smith, a motion for the adoption of the Act was carried by a large majority. The first election of Commissioners to be held on 12th February 1895. 11th January 1895, Monifieth was registered as a Burgh in the Sheriff Court Books of Forfarshire at Forfar. Bailies; Alexander Thomas Smith, David Peebles Scott. Commissioners ; William Donaldson, John Gow Taylor, William Clark, Robert Sandeman Barrie, William Mudie, David Smyton. Burgh Surveyor & Sanitary Inspector; James Munro. Medical Officer of Health; James Templeton, MD. The Burgh of Monifieth then extended to 339 acres. The main street, is situated about 30 feet above the ordinance datum and northern part of the burgh lies on a hillside that rises to a level about 100 feet above the mean water level. On the west the Dighty, and on the east the Monifieth burn, direct the course of the drainage of the burgh. The latter stream, from which Brook street derived it`s name was in 1900 covered at the expense of six hundred pounds, Lord Dalhousie contributing two hundred pounds. An Act of 1672 appointed, the Kirk Sessions the local authority for administering relief to the poor. How this was carried out is found in the Monifieth Kirk Session Records. The Poor Law Act (Scotland) of 1845 ordered that Parochial Boards be created to administer relief, maintain poorhouses, and to impose legal assessments. 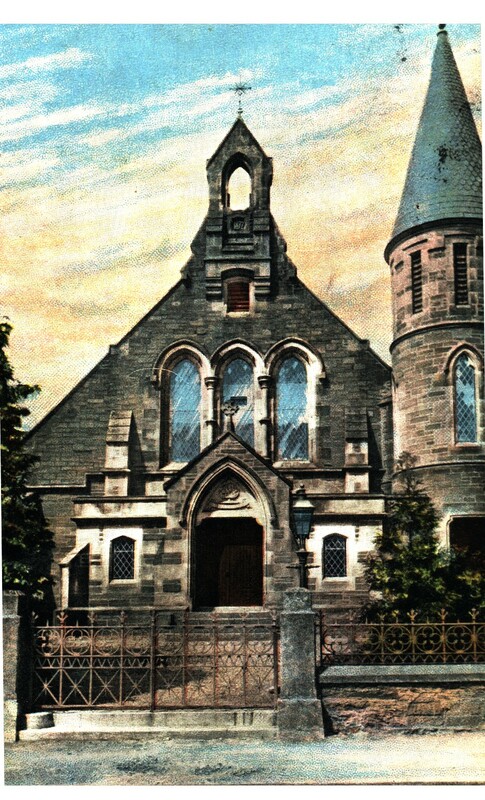 Later the Parochial Boards were empowered to carry out the law as to burying grounds, registration of births, deaths and marriages, vaccination and other matters , until these powers and responsibilities were transferred to Parish Councils on 15th May 1895, by the local Government (Scotland) Act. 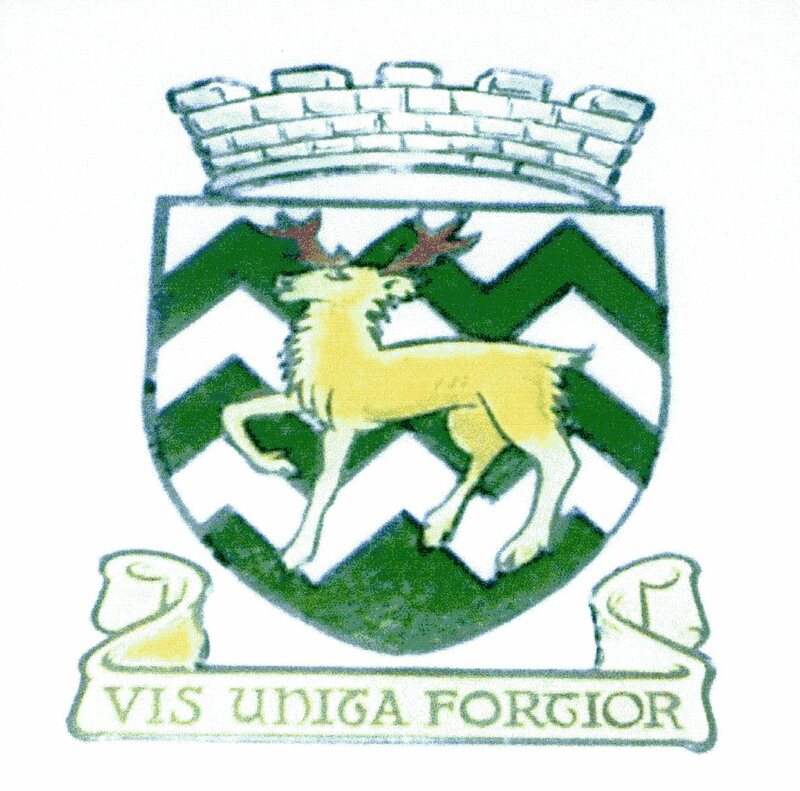 Chairmen of the Parish Council. Many people thought a tram service would benefit the residents of Broughty Ferry and Monifieth. There were proposals to form a company with a view to running an extended service to Carnoustie, perhaps even Arbroath. Had this plan materialised it would have been a continuous tramline along the banks of the Tay, from Ninewells to Arbroath, a distance of over twenty miles. As early as 1871 discussions were taking place and plans formulated. The British Electric Car Co. in 1901 were planning to construct a tramway to Carnoustie. This again failed to materialise, no further action was taken by the planners until 1904, when George Balfour began to campaign for a tramway to Monifieth. Early in 1905 a bill was passed in Parliament. In June of that summer work started immediately on constructing the track. Between Broughty Ferry and Monifieth were long stretches of tram- lines which ran through an area with no dwelling houses. Trams at Milton on Official Opening Day. At Milton of Monifieth a power station, Offices and car shed were built. The red brick building can still be seen today, having spent some time after the demise of the trams, as a carpet factory. The shed housed a repair shop, paint shop, store -room and a blacksmith`s shop. At a later date cottages were built , at Milton, for some of the Tram company staff.. Within the power station were three Lancashire, coal fired boilers, which were water cooled with a supply piped from the nearby Dighty burn . James H Shepherd was appointed first General Manager of the new line of the Dundee, Broughty Ferry and District Tramways Company. The first car assembled at Milton was ready for service, however, when it was on the track for a trial run, a serious fault was discovered. The running gear or trolley had been put on the car facing the wrong direction. The remedy for this problem was to turn the car end for end on the track. This required a special type of junction to perform this manoeuvre. In order to perform the operation it was necessary to drive the car into Dundee, up Reform Street, Constitution Road, then reverse at Coldside and return down Moncur Crescent, Victoria Road and Commercial Street, to the High Street. Reversing from there and again joining the Ferry Road line. This journey was made with great secrecy in the early hours of the morning. With the car now facing the right direction the first run over the route took place on 13th December 1905. Some of the passengers complained that when on the upper deck of the official car, they had their hats knocked off by overhanging branches of trees. On 19th December with the line inspected and passed as correct, two cars, one from the Corporation and one Company carried the dignitaries to the terminus. The Official opening of the line did not in fact take place until Wednesday 27th December 1905, when the power station was complete and the fares had been agreed. Three cars decorated with red white and blue bunting, carrying invited guests travelled through decorated streets to Monifieth. Ex Provost Brownlee , of Dundee, Chairman of the Company gave a short speech from the top of the first car. The public service started at 2pm, carrying large numbers of passengers. In 1908 the line was extended from Union Street to the top of Tay Street, a distance of some 300 yards. The service was now run by one Corporation car to every three Company Cars the fares being kept by the cars owners. With the introduction of a bus service on 16th June 1930 with a frequency of every 30 minutes from the City centre and drawn out `take over` wrangling between the tram companies brought about a decrease in the numbers of tram passengers. The last tram ran to the Milton depot at 10.45 pm on 15th May 1931. Car No 13 being the last to leave Dundee. According to Miss Dorothy Rattray of Monifieth, the driver was her mother and wife of ex Provost J.M. Rattray of Monifieth. J F Low , Manufacturers & Iron Founders. At the beginning of the nineteenth century the Milton Mill was owned by the Fairweather family. James Fairweather, a successful businessman had amassed a considerable fortune. He had two children a son George and a daughter Jane. George had no interest at all in the spinning mill but was a very keen artist. Jane was quite an astute person who married a wood turner named William Low, who manufactured bobbins for the spinning industry. Around 1811 on a site where there had been industrial premises from 1806 Monifieth Foundry was started by the Low and Fairweather families ,on a very small scale for the manufacture of machinery for the flax industry. It is recorded that the first carding machine used in the processing of flax was made by their firm in 1815. On the death of Jane`s father about 1820, William found himself to be the sole beneficiary of his will. 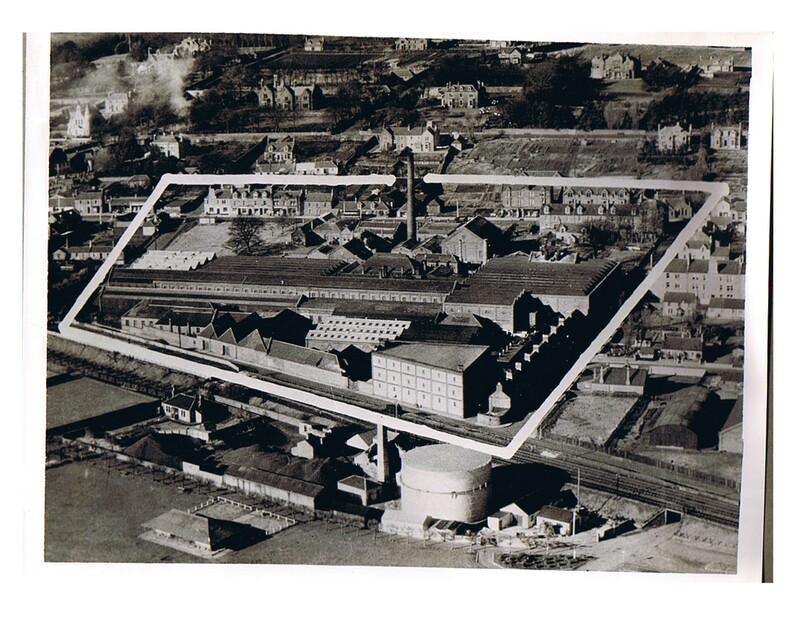 The Milton Mill was closed and Monifieth Foundry was rapidly changed into a very successful engineering works. William Low was a clever ambitious man , who welcomed his brother in law George Fairweather into his household. What was done with his father`s fortune did not disturb George, so long as he had plenty of good things to eat and fine clothes. However, George did prove to be of great help to the expansion of the business. Under instruction by William and his sister Jane he was sent equipped with a special silk hat, lined in the crown with sheets of drawing paper, to work in the factory of Sir Peter Fairbairn, in Leeds. was searching for head lice in the hat. Returning to Monifieth George had acquired one hundred sheets with drawings and plans of how Fairbairns`s manufactured machinery. So the Monifieth works grew and the little village grew also. George was given a pension for life and was able to afford a new hat each time the fashion changed. The Earl of Panmure granted the lease of the land on which the factory stood on a ninety- nine years lease, at a yearly rental of four pence per acre. From it`s inception the business prospered and with the establishment of jute mills in India benefited even more. James Fairweather Low, son of William and Jane , with his brother Samuel Low developed and expanded the Foundry which was a dominant factor in the development of Monifieth . The working relationships between men and masters were of the friendliest nature. Trade disputes were very rare. Following the death of James Fairweather Low in 1901 his son William turned the business into a limited company. The foundry workforce, on average numbered over 500 men . During both World Wars this was increased by the employment of women in the production of ammunition and aircraft parts. In 1814 there had been in industrial premises an agricultural implement maker in Monifeth named James Davidson, who in a show at Trinity Muir , Brechin won a prize of five guineas for the best cart, another two guineas for the best wooden plough, and a premium of seven guineas for his invention of a machine which ploughed sowed and finished two drills of turnips at the same time. Many are the stories relating to the Earls of Panmure, one in particular relating to the granting of the lease to Monifieth Foundry is as follows. At the Coronation of Queen Victoria the titles of the Lords of Panmure were restored and there were great festivities at Panmure House.Willie Low`s black laddies, dressed in their best, with a musical band, and many emblems of their craft were there. So pleades was his Lordship at their turn out he granted to Low`s , of Monifieth ,the lands at Monifieth, at a yearly rental of four pence per acre causing the apprentice boys to think that it was theirs and not Lows. William, Lord Panmure , invited one of his tenants, Mr Sime of Panlathie, to have dinner at Brechin Castle. Sime was also requested to bring a considerable sum of money with him. Arriving at the Castle, where he considered there would be some fun, Sime found that he was in the company of an English and Irish Peer. After dinner his Lordship gave the first toast: “All hats in the fire, or ten pounds on the table”. All hats were burned. The Englishman followed with “All coats in the fire, or twenty pounds on the table” The coats quickly followed the hats. It now remained for Mr Sime to give the finishing stroke, which he did by walking up to the fire, and calling,”Two front teeth in the fire , or one hundred pounds on the table”. Needless to say this was a poser, as none of his Lordship`s guests had false front teeth. They therefore, after a hearty laugh, paid down the cash and Mr Sime returned to Panlathie £300 richer than when he left. At a hotel in Brechin, where the waiter had displeased him, he grabbed the unfortunate servant and threw him out a third story window, to the street below. The landlord appeared greatly distressed and informed his lordship that he had killed the waiter. He was admonished by a wave of the hand and an acknowledgement as that was what he had wanted to do. The earliest mention of golf in the district refers that about the mid sixteenth century the Earl of Panmure” played golf on Barry Links where the `stake ` was for drink. If he lost he never honoured the bet but had one of his servants pay for it”. His name was `Skit`, at least that was his nick name. His mother had died when he was just two years of age. His father was a `packie` (packman), who travelled around the courtyards selling reels of thread, buttons, safety pins, needles etc., and the poor man did not have much time to care for his son, with the result, `Skit` was just allowed to please himself. He was as often absent from school as the number of days he attended, and consequently the Probation Officer was often found hounding `Skit` to school. Even his father at times dragged him up to the school entrance gates, but that did not prevent `Skit` doing a disappearing trick by climbing over Thos. Muir, Son & Paton`s coal shed and skipping off to the shore, where Skip was happiest playing about with boats, of which a dozen or so were at the beach. One man `Skit` did not like; This man wore a deep sea cap and a double breasted reefer jacket, and had a red beard. Everyone called him the Sea Pirate, and every time `Skit` saw him at the beach, he would shout “Sea Pirate”, then take to his heels. Over the sand dunes `Skit` was chased but never caught. `Skit` stayed in the bottom house of `Podlie Raw` , and one day the `Sea Pirate` was just going through the railway tunnel when `Skit` shouted “Sea Pirate”, then skipped into the house leaving the door open. The `Pirate` went in the house, but `Skit` had escaped out the small back window, rushed around to the front and locked the `Pirate` in. Then `bold as brass`, he ran up to the Police Station on the High Street, and told the bobby that “there was a burglar in his house”. You can imagine the look of wrath on the `Sea Pirate`s` face when the door was opened. However, a skelp on `Skit`s` lugs solved the matter. `Skit` loved the sea and boats and when he was of an age joined the Royal Navy. That was the life for him. He rose to the rank of Chief Petty Officer and was decorated during the First World War. He returned after twenty years in the Senior Service where he was the middle- weight boxing champion. He `took over` and managed a Dundee pub in his retirement. `Skit` has passed over now, but it is good to record that the `wild laddie`, who was the bane of the teachers, made good in the end. This entry was posted in Articles and tagged Ashludie, Eglismonichty, Fichem, James Low, Maule, Miss Rattray, Monifieth, Provosts, smuggling, St.Rule, Wm. Low. Bookmark the permalink. to come across a blog every once in a while that isn’t the same out of date rehashed information. Fantastic read! I’ve saved your site and I’m including your RSS feeds tto my Google account. So wonderful too discover another person with some original thoughts on this subject. Really.. thank you for starting this up. This site is one tning thhat is needed on the web, someone with a little originality! this is what I need. Thank you for keeping this site, I’ll be visiting it. information you present. It’s good to come across a blog every once in a while that isn’t the same outdated rehashed information. Your style is very unique in comparison to other people I’ve read stuff from. Thank you for posting when you’ve got the opportunity, Guess I will just bookmark this web site. I think the admin of this web site is genuinely working hard for his web page, because here every data is quality based data. Your mode of explaining the whole thing in this article is in fact good, all be capable of without difficulty know it, Thanks a lot. to pay a visit the site, that’s what this web site is providing. Great web site you’ve got here.. It’s difficult to find excellent writing like yours these days. Ӏ’ve been browsing online more than 4 hours today, yеt I nevеr found any interesting artіcle like yourѕ. website owners and bloggеrs made good content as you did, the weЬ wіll be much more useful than ever before. i could also make comment due to this brilliant article. I like this web site very much, It’s truly good to read and also learn more information. As I website owner I believe the content material here is definitely wonderful. This article has really peaked my interest. I will take a note of your website and keep checking for new details about once per week. Hello there, You’ve performed a great job. I will certainly digg it and for my part recommend to my friends. I’m confident they will be benefited from this web site. Excellent post. I was checking continuously this blog and I am impressed! Extremely useful info specially the last part 🙂 I care for such info much. I was seeking this particular information for a long time. Thank you and best of luck. Thanks for your personal marvelous posting! I actually enjoyed reading it, you’re a great author.I will ensure that I bookmark your blog and will often come back in the future. I want to encourage you to continue your great posts, have a nice weekend! It’s really a nice and useful piece of information. I am happy that you shared this helpful information with us. Please stay us up to date like this. Thanks for sharing. Greetings I am so grateful I found your blog page, I really found you by error, while I was researching on Google for something else, Nonetheless I am here now and would just like to say thank you for a remarkable post and a all round interesting blog (I also love the theme/design), I don’t have time to browse it all at the minute but I have book-marked it and also added in your RSS feeds, so when I have time I will be back to read more, Please do keep up the great work. Excellent blog post. I definitely love this site. Continue the good work! Thanks for finally writing about >Monifieth Tales – Fact or Fiction <Liked it! Excellent, what a website it is! This weblog provides helpful information to us, keep it up. Spot on with this write-up, I actually believe this amazing site needs a lot more attention. I’ll probably be returning to read through more, thanks for the information! Hi there to every single one, it’s truly a pleasant for me to pay a visit this website, it includes valuable Information. You ought to take part in a contest for one of the highest quality blogs on the net. I most certainly will highly recommend this blog! I know this site offers quality based content and additional data, is there any other web page which provides these kinds of data in quality? Merely wanna remark on few general things, The website pattern is perfect, the content is rattling great :D.
I was very pleased to find this web site. I need to to thank you for your time for this wonderful read!! I definitely enjoyed every part of it and i also have you book marked to see new things on your website. Good day I am so happy I found your blog, I really found you by accident, while I was looking on Yahoo for something else, Anyways I am here now and would just like to say thank you for a incredible post and a all round enjoyable blog (I also love the theme/design), I don’t have time to browse it all at the moment but I have book-marked it and also included your RSS feeds, so when I have time I will be back to read much more, Please do keep up the fantastic jo. Wonderful, what a web site it is! This weblog gives useful information to us, keep it up. Marvelous, what a website it is! This weblog presents useful data to us, keep it up. Thanks to my father who informed me regarding this website, this web site is in fact amazing. When someone writes an piece of writing he/she keeps the image of a user in his/her brain that how a user can be aware of it. Thus that’s why this post is great. Thanks! Quality content is the crucial to be a focus for the users to pay a visit the web site, that’s what this web site is providing. May I simply just say what a comfort to find somebody that actually understands what they’re talking about on the web. You actually realize how to bring a problem to light and make it important. A lot more people must check this out and understand this side of your story. I can’t believe you aren’t more popular given that you most certainly have the gift. Good site you have here.. It’s difficult to find high quality writing like yours these days. I seriously appreciate individuals like you! Take care!! Just want to say your article is as astounding. The clearness in your post is simply spectacular and i could assume you are an expert on this subject. Well with your permission allow me to grab your feed to keep updated with forthcoming post. Thanks a million and please carry on the rewarding work. Excellent site you have here.. It’s hard to find good quality writing like yours these days. I honestly appreciate people like you! Take care!! Greate article. Keep posting such kind of info on your blog. Im really impressed by your blog. Wow, fantastic blog layout! How long have you ever been blogging for? you make running a blog look easy. The overall look of your site is fantastic, as neatly as the content material! Wonderful, what a web site it is! This website presents valuable information to us, keep it up. Hi to all, the contents present at this website are truly awesome for people knowledge, well, keep up the good work fellows. Simply desire to say your article is as amazing. The clarity on your put up is just spectacular and that i could assume you are knowledgeable in this subject. Fine with your permission let me to grasp your feed to keep updated with imminent post. Thanks a million and please carry on the enjoyable work. You are so interesting! I do not suppose I’ve read through anything like this before. So great to find somebody with a few unique thoughts on this issue. Seriously.. many thanks for starting this up. This web site is something that is required on the web, someone with some originality! Hi there I am so happy I found your webpage, I really found you by mistake, while I was looking on Google for something else, Anyways I am here now and would just like to say cheers for a marvelous post and a all round enjoyable blog (I also love the theme/design), I don’t have time to browse it all at the moment but I have saved it and also added your RSS feeds, so when I have time I will be back to read much more, Please do keep up the superb job. Very clean website, appreciate it for this post. Hey There. I found your blog using msn. This is a really well written article. I will make sure to bookmark it and return to read more of your useful info. Thanks for the post. I will certainly comeback. I was examining some of your content on this site and I think this web site is real informative! Keep putting up. I just wanted to thank you a lot more for that amazing web-site you have produced here. It truly is full of useful tips for those who are really interested in this particular subject, especially this very post. You really are all so sweet along with thoughtful of others as well as reading your site posts is a great delight to me. And exactly what a generous surprise! Tom and I really have enjoyment making use of your suggestions in what we should instead do in a few weeks. Our collection of ideas is a mile long which means that your tips will be put to beneficial use. Very efficiently written post. It will be valuable to anyone who usess it, including me. Keep up the good work – can’r wait to read more posts. Wonderful, what a webpage it is! This webpage provides valuable data to us, keep it up. Some truly superb articles on this web site, thanks for contribution.